This pattern is NOW AVAILABLE as a special inclusion to the Knitters of Oz: Part 1 ebook. 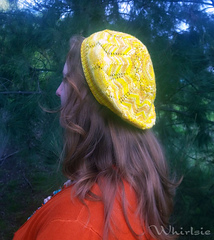 The Leaving Kansas Beret has been designed to coordinate with the Leaving Kansas scarf pattern. 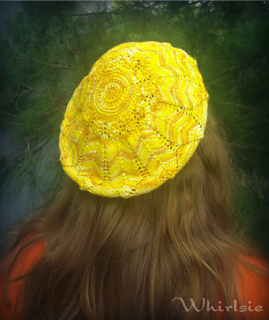 This beret uses the same sunflower motif, with additional eyelet rounds for the edging. This motif is knit in the round, top down, with the ribbing added at the end for the band.